Note the lying advertisers to the right of his status update? 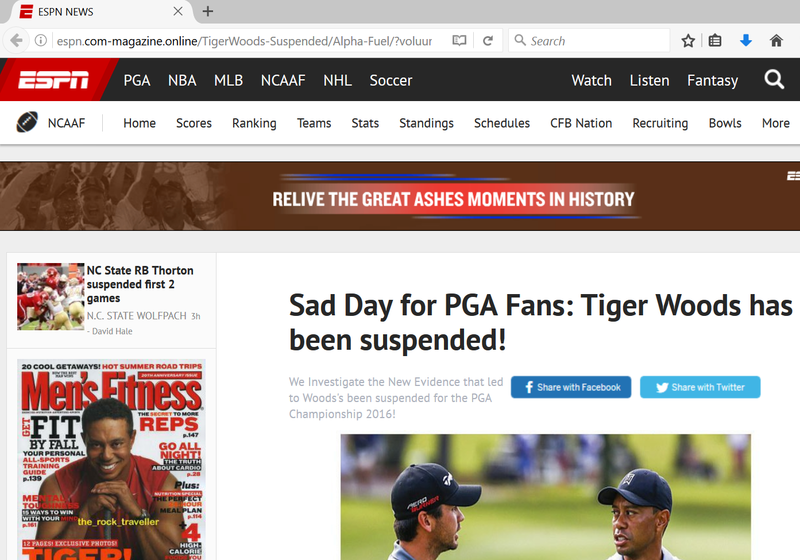 (No, Hugh Hefner isn't dead, and no, Tiger Woods hasn't left the PGA forever.) Those ads don't even lead to news stories. The first one leads to a site selling cures for erectile dysfunction, and the second leads to a site selling testosterone booster. But there's something even worse about these two advertisers. Both of their web sites are designed to look like actual news sites. Clicking on the "HUGE HEFF ENDS HIS LIFE" link, for example, leads to this. That story also isn't true. (It doesn't even match the headline on the ad...) But more importantly, that web site isn't Fox News. It's a quick knock-off that's intentionally designed to con people who don't notice that it's got an entirely different URL. And the other advertiser on Zuckerberg's post is using the same trick — this time, pretending to be ESPN. It's the same old con. That story's not true — and that site's not ESPN. 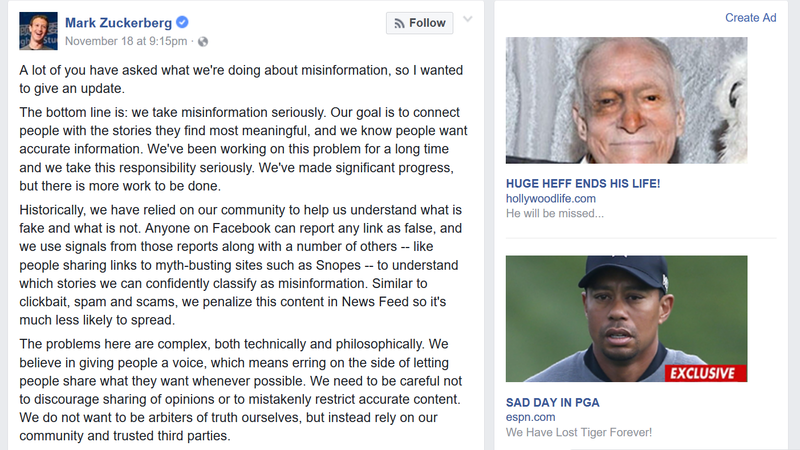 So remember these screenshots the next time you see Mark Zuckerberg claiming that Facebook is cracking down on fake news. He can't even keep it off of his own Facebook page. So how's he going to keep it off of yours?